What Is a Drain Field and How Does It Work? 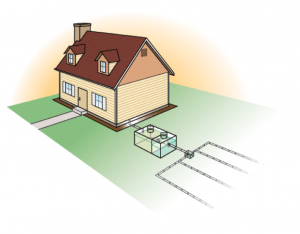 West Coast Sanitation > Blog > Septic Tank > What Is a Drain Field and How Does It Work? Drain fields, sometimes called leach fields, are vital to the sewage treatment process. As sewage passes through the septic tank, solids are removed through settling and bacterial digestion leaving only liquid waste. This wastewater is fed into perforated pipes buried below the surface. The pipes serve to distribute the effluent over a larger surface area where it is slowly absorbed into the soil. A drain field is designed with a series of trenches. Perforated pipes are laid into the trenches, which are then filled with gravel, allowing the wastewater to be absorbed at a prescribed rate. As the water is absorbed bacteria are filtered out by the soil, which protects underground water sources from contamination. A poorly functioning drain field can pollute drinking water sources and cause substantial environmental damage. Regular septic system maintenance, which includes removal of solids from the septic tank, is crucial to preventing drain field failure and ensuring proper function of the treatment system. If you need assistance with septic system design, contact West Coast Sanitation Inc. in Riverside today. Does Your Septic Need To Be Pumped? Why Is My Toilet Leaking at the Base? Septic Tank and Sewage Disposal Services.